This is a list of glitches in the game Mario & Luigi: Superstar Saga. To trigger this glitch, the player should use the advanced version of Cyclone Bros. during the Bowletta fight. If she gets Dizzy, the player should then "defeat" her quickly. She will then act out the entire cutscene that follows while still being dizzy. This is fixed in the Japanese version if she was Dark Bowletta during "defeat". A similar thing will happen with Cackletta Soul's arms and heart if the head is made dizzy. In the first area, the player must head to the second area and get off the mushroom by the gear shop. Then they must face the screen and have Luigi shock Mario. They must walk forwards and towards the mushroom ledge and Mario will be on thin air. Then they must jump as Mario and switch so Luigi is in the front and jump as Mario. He will fly away. Hit START so the camera focuses on nothing and jump as Mario until the camera centers on him. The both jump and they will both be on thin air. Both jump again and they will be above the gear shop. If Luigi jumps first then Mario jumps Luigi will disappear and Mario will automatically land and enter the item shop. Another glitch is to get on thin air and jump as Mario and switch so Luigi is in the lead and change Mario's icon to spin jump. Hit B so Mario flies away and hit it again. Mario will appear on the other side of the mushroom ledge briefly. Hit START and Mario will be on the other side of the ledge and both bros. will be onscreen. Attempting to move will make Luigi appear right behind Mario. When battling Jojora and her friend, Mario and Luigi must damage Jojora multiple times until her HP is 1, then use the Advanced Version of Bounce Bros., Jojora will be defeated and her friend will get damaged, but Jojora's dialogue: "You NEVER touch a lady without her permission!" will appear, but Jojora wasn't even there. There are no problems while doing this glitch. Right after the player acquires hammers, he or she should make Mario the leader. The bros. must go up to a water fountain and make Mario ingest water. Luigi should then hammer Mario until he runs out of water. When Mario is angry at Luigi, he can fly up. Other times, he can face the fountain. Either way, Luigi walks away from Mario. Even if Mario moves through the wall, he may be refilled with water, and he can move, but he will warp to Luigi, making it appear that he is falling. The game occasionally, however, may also make the brothers clip through the wall, locking the game and forcing the player to restart. This glitch stops working once the Bros. learn the hammer techniques since Mario's angry reaction is replaced by the Mini-Mario technique. The Racing Bob-omb Glitch, where the Bob-omb sprite appears to be placed in the foreground of the pillar. In the beach area east of the Beanbean Castle, the Bob-omb will race around when the bros are near them. If the bros are standing on top of a raised portion of land where the Bob-omb cannot attack them, but the Bob-omb is triggered into the "excited/racing" mode, then even if the Bob-omb is hidden behind the raised portion, when it starts racing around, the sprite will appear in the direct foreground, in front of the pillar of land. 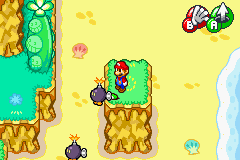 This effect ends when the Bob-omb returns to its normal, walking mode. If the person in front jumps up a set of stairs while the person in back does not, the person in back will teleport forward. This can be done at any time during the game, as long as the player has a sufficiently long set of stairs. 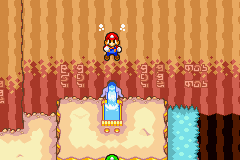 The player should perform the "Mario Flying Glitch" above, on the fountain, one screen east of the "Hoohoo Mountain Watering Hole", and have Mario go straight down. (To do this, have Mario fill up at the fountain, then move north a bit, then have Luigi hit Mario with the hammer four times. Mario should fill up again, but when the player moves, Mario will teleport right next to Luigi, but up on a ledge.) 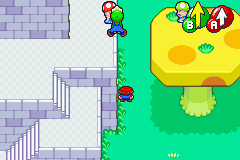 Then, the player should drop off the ledge onto the stairs below, and if Mario moves too far, Luigi will catch up to him, and they will teleport back a short distance. To end the glitch, the player should enter the screen on the left, or have Luigi High Jump on Mario. 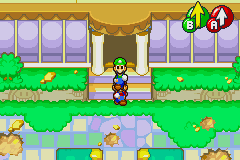 When Mario and Luigi exit the Starbeans Cafe, the sprite of the person in the back is actually in front of the sprite in the person in front for a short while. If the player goes to Guffawha Ruins when they have both Mario and Luigi, the gates will be closed, but if the player performs one of the "dual jumps" (High Jump, Spin Jump) under the arches, the player will be on top of the arches. Just outside the Pipe House in Beanbean Castle Town, are two small holes that lead to a small, maze-like area. If Mini Mario uses the Firebrand technique in this area while partially hidden behind a wall, he will appear to be standing on top of it. He will return behind the wall once the player releases the button and the technique ends. A glitch where Mario and Luigi's hammer action icons aren't meant to be shown. When Bowletta uses her fireball attack, Jump icons appear as it must be. But when the attack is finished, Hammer icons are seen for a short time. Similar to the above, this glitch is caused during the Bowletta fight. 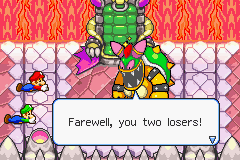 To trigger this, Bowletta's health must be low when she becomes Dark Bowletta and starts throwing stars at the player. If the player throws enough back at her to defeat her, but also gets defeated him or herself, the player will see a mixed scene of Game Over and Bowletta sucking them in. Instead of switching to Bowletta's stomach, the player will come to a black screen, with the eerie tone of Cackletta's slow music being looped until the player resets the game. When Gigi demonstrates the advanced Firebrand technique, and also in Mario's "surprise" to Gigi (when Mario is sitting in the chair), the Thunderhand sound is played instead. 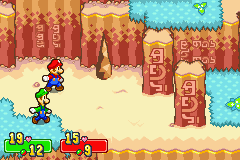 If Mario and Luigi run into a Nokottasu while they are using the Dash, the dashing sound is continuously played until the suitcase is opened, or if the player leaves the screen or enters battle. If Mario and Luigi run into one of the rolling metal bars while any one of the six hand sound effects are being played ("charging", "fully charged", and "in effect", with two of each), it will be continuously played. Some of the sounds can even be stacked on top of each other (so that they're playing at the same time). As with the above example, the sounds can be stopped by opening the suitcase, leaving the screen, or entering battle. If Luigi gets filled up with water by the garden hose that is northeast of the Teehee Valley entrance, instead of Luigi making his normal sound effect when he empties himself of water, the sound of an Oho Jee speaking will play instead. If Mario and Luigi High Jump or Spin Jump into the flaming rock southwest of Hoohoo Village, they will yell, but if they simply walk or jump normally into it, they will perform the same motions but not make any sound. Also, if Mario is filled with water and walks into it, he yells but Luigi doesn't. If the player has Mario turn into Mini Mario, by having Luigi hit him with his hammer and walk into an area where the music changes, the player should notice that the music didn't change. Even though this happens with most areas, it doesn't happen with all places. This can also result in comical effects, such as the underground theme playing in Beanbean Castle Town. Having Mini Mario entering pipes always results in this glitch. However, this will not work upon exiting the warp pipe in Joke's End. The lack of music changes also happens with the Luigi Dunk and even with the advanced Firebrand and Thunderhand techniques, although it works less frequently. These glitches have been fixed in the Japanese version. Additionally, after Luigi is taken by the crane in Woohoo Hooniversity, if Mario hits the Save Album while moving left and continues to hold left, he will walk a short distance down the nearby staircase. If the player Saves and Quits, then reloads the game save, there should be no music. However, fighting one of the nearby enemies will cause the background music to change to the save-file music. The music will revert to normal if the player does not fight an enemy before saving Luigi, otherwise it will revert back after saving again, after the cutscene with Cackletta, or upon leaving the Hooniversity. If the player saves at the "Teehee Valley Fungitown Side" Save Album when Mario is Mini Mario, or if Luigi has been Luigi-Dunked, no music will play. The music returns, however, when the player leaves that screen. Finally, if the player saves and quits when Mario has water in his mouth (like in the Woohoo Hooniversity Basement), then reloads the game, no music will play. After Luigi begins pulling on one of the Piranha Plants on the runway and Mario begins explaining something to Lady Lima, the gibberish talk Mario makes is actually Luigi's voice, not his. This glitch can be activated with the last Popple battle (with Birdo) and the Jojora battle. The player must first hurt either Popple or Jojora's Friends enough so that a Fire Bros. attack wouldn't kill it, but the burns will. Second, the player must Burn either Popple or Jojora's friend with Fire Bros., the advanced version being easier to burn. The player then just has to wait until Popple or Jojora's friend dies from their wounds. If they use an attack that needs to be countered, the player needs to let it hit them. Once the victim dies, their partner will act as if nothing had happened. Birdo will attack normally instead of getting angry and if she uses her egg attack, a "ghost" sprite of Popple will appear onscreen but it can't be damaged nor can it attack. Jojora will continue to use her wand move, and if the player knocks it away, the game will freeze once Mario and Luigi attacks nothing. Much like the "High Jump Glitch", this glitch will make all sprites from the screen vanish. To do it, the player needs to have the advanced version of the Cyclone Bros.. When finding an enemy, the player needs to fight it. They should use the Cyclone Bros. to make one of the enemies dizzy, then they should kill the enemy right after. Shortly afterwards, all sprites (e.g. Mario, Luigi, remaining enemies, etc.) will vanish. The music will still be playing, but all the player can do from there is to reset the game. Note: This glitch will not always work; it works mostly in Bowser's Castle. While Luigi is going across the bridge to Piranha Bean, if the player tries to fall off just as the player reaches Piranha Bean, Luigi will fall off and the plant eats the bean, but will not see Luigi. This results in just the plant standing there and the player will have to turn their game off. In the beach area, where Luigi turns into a surfboard, if the player steers Luigi onto a nearby shore into a Bob-omb enemy, Luigi will be normal during the battle. Also, if the player defeats the enemies, or opens the suitcase when in midair, the game will freeze. In Little Fungitown, the player must go to the Toad looking at the Toad on the mushroom. The player must make Mario small and walk towards the Toad. 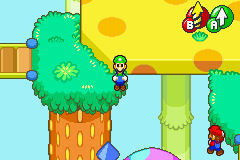 When the player is underneath it, the player should have Luigi High Jump on Mario and make Mario jump to produce a coin. Mario will fall off the ledge, unable to move around and Luigi will be stuck on top of the Toad, still in pain and completely frozen. The player must reset the game after this. In this glitch, Mario and Luigi will disappear from the screen and will never appear again until the player resets the game. To do this, the player must first defeat Fawful in Bowser's Castle and then save in the next room. After that, the player should have Mario in front of Luigi, and Luigi behind Mario. Next, the player should make Mario into Mini-Mario by having Luigi hit him with the hammer. Once Mario is in his mini form, the player should go back to where Fawful was fought and walk to the bottom right corner. Once at the corner, the player should have Luigi perform a High Jump but have Mini-Mario hit him by jumping while he's in the air. If performed correctly, Mario and Luigi should disappear, but the music will still play. Mario and Luigi will never reappear; all the player can do is turn off the game. To do this glitch, the player must break the empty pillar, then the second pillar with a Bros. Attacks. If Mario and Luigi learns an advanced attack as Hoohooros moves, Hoohooros will not attack as well as Mario and Luigi. Instead, he will watch the bros. forever. The player must turn their system off and it will be normal. If the player gives a bro a red or green pepper, and lets the bro get knocked out, upon reviving the bro, the pow/def pepper boost will still be there, and remain there for the rest of the current battle. This makes it very easy to beat bosses if the player has a steady supply of peppers, 1-UP Mushrooms and/or 1-UP Supers without having to waste the clothing slot on a booster clothing such as Harhall's Pants. 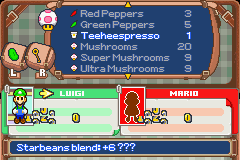 When the player goes to the Starbeans Café, and hits Luigi with a hammer into the ground, the player must talk to the café host and try making different drinks. Should a cutscene with Luigi be triggered, Luigi will run back and forth with various side effects; sometimes Luigi appears above ground and sometimes he stays below ground. But after the cutscene, Luigi is in the ground again, and after the player stops talking to the Starbeans Café host, the player can walk around in the café at normal speed when Luigi is in the ground. Normally the player would walk slower when Luigi is in the ground. The effect will stop when Luigi goes above ground. If the player uses the Firebrand Bros. move at the Winkle area pointing towards the statue at the north of the said area, before meeting Popple, Mario and Luigi will run further instead of walking to Popple and the statue. This technique also works at Bowser's Castle before meeting Iggy. If the player uses the Firebrand Bros. move here (pointing towards Iggy before meeting him) they will run further as well. The player must have advanced Swing Bros. to do this. The player must go to the Fawful battle and knock him out of the mech. Once he's out, the player must use the Swing Bros. to steal his Golden Mushroom. Then the player must make Fawful give them a Game Over, but instead of starting from the last save point, they must start from Beanbean Castle. 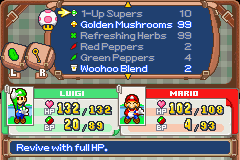 The player will keep the Golden Mushroom and the player can do that with Fawful as much as he or she likes. This glitch also works with the final Popple battle. A glitch where Mario and Luigi's stats appear scrambled. This glitch contains a graphical glitch and a physics glitch. If the Bros. are split up, the player can't give Teeheespresso to the active brother. Instead, the stat symbol sprite gets scrambled for a split second. The inactive brother, however, can drink the Teeheespresso, despite the fact that the player can't give any other items to the inactive brother. Note: This glitch is not present in the Japanese version. This glitch may be merely graphical, or lead to freezing. Bosses and scripted enemies within this game have an additional 5000 health added to them in order to prevent them from being defeated before their cut scene. Defeating these enemies by dealing more than 5000 via unusually high stats, mush badges, bro attack infinite combos, etc. will cause the game to become glitched, displaying the victory screen at the same time as a cut scene. This may lead to freezing, invisible enemies, or simply a glitched cut scenes depending on the foe defeated. Enemies that qualify for the glitch include Hermie III, Bowletta, Cackletta Soul, and others. Note: this glitch is exclusive to the English version of the game. The Japanese version doesn't allow enemy HP to drop below 4999. This page was last edited on April 20, 2019, at 23:19.